ROAD TOWN, Tortola, VI – New Commissioner of Police Michael 'Mick' Matthews said he intends to get the communities of the territory behind him for support as he settles into his new position to fight crime. “Obviously yesterday (April 20, 2016) was my first day in post...I got sworn in and you know what its going to be like for the next few days...it will just be meeting and greeting people and getting to understand the construct here and who does what,” he said. “I am very aware that already people are speaking to me about their concerns about law and order on the islands...how important is it that the community has a voice,” he said. He said his mandate here would be to maintain law and order and to continue the work of the Royal Virgin Islands Police Force. 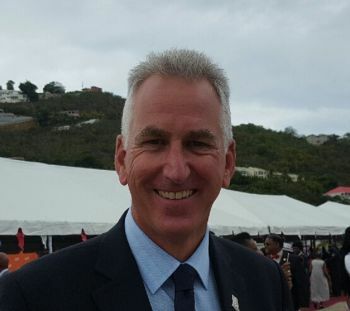 Matthews arrives in the territory after some eight months since former Police Commissioner David Morris left the territory and the vacant post being snubbed by a United Kingdom police officer Robin Smith. Matthews was sworn into office on April 20, 2016 by Senior Magistrate Tamia N. Richards. Mr Matthews, a UK national, takes over the reins of the Royal Virgin Islands Police Force (RVIPF) at a time when it has been rocked with allegations of corruption and increasing armed robberies in the territory. Earlier this month, the RVIPF announced that three of its officers were charged for alleged corruption. They have since been remanded to prison. Police corruption and armed robberies are already two major issues that stand out for Mr Matthews to address as Commissioner. Another troubling issue on the plate for the new CoP is alleged racism in the force. In August 2015 Virgin Islands News Online had first and accurately reported that Mr Robin Smith of the United Kingdom had been given the job of Police Commissioner, however, Mr Smith suddenly withdrew in October. According to a press release from the RVIPF, the former Chief Constable for the Sovereign Base Areas Police in Cyprus and 34-year veteran law enforcer successfully climbed the ranks of the Gloucestershire Constabulary in the UK and is now on contract with the Royal Virgin Islands Police Force for the next three years. “In his role as Commissioner, Mr Matthews will be the overall strategic commander of the Force ensuring that the Force is in compliance with legal requirements as well as standard policing practices, policies and procedures overseas. He will also provide operational policing leadership and mentorship to divisional heads. Among his accomplishments, Mr Matthews drafted and delivered on an overall strategic plan for reducing crime levels while maintaining detection rates that were above 50%. At the same time, he was able to establish a comprehensive recruitment plan for officers and maintain a high level of trust and confidence from members of the local community in Cyprus, the press release stated. time will tell. u have 35 unsolved murders to start with. @Expat You quoted the exact number of murders...without doubt you are a Cop and a trouble maker. Our Community are looking for Police Officers who are not self centered. Your tone suggested that you hope the Gentleman fails but to me if he does, so will my Country in terms of law and order. If you have no concern for this Territory do the right thing. If only there was a golf course here. What he does in his private life, outside of contracted hours is nothing to do with you, providing it is not illegal. So what if he wants to play golf in St Thomas. The reality is, with attitudes like yours, he will find it so hard to succeed here. It will be your (our) failure not his! Do you work 24/7/365? Where do you take your breaks or spend your holidays? Them bring another white head commissioner of police here again? They don't have work in the UK for them? Them enslave us; them ruling over us; and them want to muzzle us. Shake off the mantle of Colonialism, people. It is worst than any NDP, VIP, PEP or MYOP. Let's start to talk. remember governor Duncan can't say if he racist or not! I'm sure he's aware of the losing battle he will be fighting. BVI people despise the police, non-BVI persons, non-blacks, those with prominent names, successful persons, high acheivers, and generally anyone outside their own family. Agreed, while at the same time praising or sympathising with criminals. It really is close to an impossible job. Good luck! @Duck Duck Goose you need to broaden your circle, stop being so myopic. Same Old, Same Old, Same Old. . . BVI = vacation for UK cops and Governors. This is a punishment JOB for them. . . why would either want to come here? ? ? Last hurrah before retirement. That is why they so old n worn looking. Old age equals experience and the ability to manage and see through smoke screens.